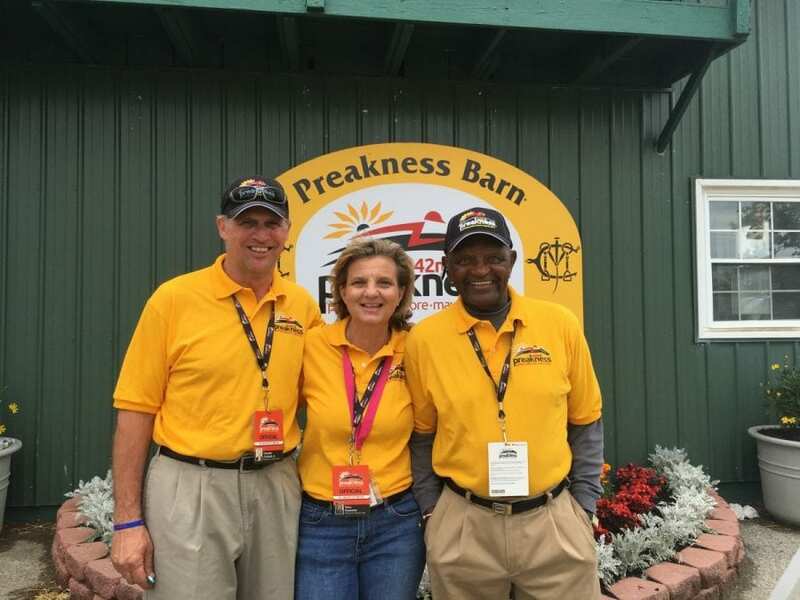 From left: Tim Tullock, Terri Overmeier, Charlie Hall. Photo by Teresa Genaro. Not since his days training such outstanding stakes winners as Buster’s Daydream, Sensibly Chic and Abbondanza has Tim Tullock spent as much time talking horses as he does in his current gig. A full-time outrider during morning training at Laurel Park, Tullock trades in his radio, protective vest and riding boots each live-racing afternoon for a jacket, tie and headset in his latest role as one of the track’s on-air racing analysts. The 54-year-old Tullock joins Stanton Salter as they make and discuss their selections in each of the day’s races, puts together affordable tickets for multi-race wagers as well as review and preview races and events for the benefit of the general and betting public both at Laurel and on its simulcast signal. Tullock first began filling in at the analyst’s desk on an as-needed basis in the fall of 2016 before being given a more regular presence during the 2017 summer meet. In the latest evolution of Tullock’s racing career, he is able to draw upon more than two decades for experience as a trainer – the majority of it spent based in Maryland – as well as his background of growing up attending and working on the once-thriving and popular New England fair circuit. Tullock’s outriding job came about much the same way, taking on more responsibility from MJC then-Vice President of Racing and Racing Secretary Georganne Hale once he decided to give up training in the summer of 2015. Hale was named Vice President of Racing Development July 2. Tullock ran his last horses Aug. 4, 2015 at Parx; both finished sixth. After 540 career wins and more than $13.3 million in purse earnings, he decided it was time to put family first. He and wife, Jillian, the MJC’s assistant racing secretary, have seven-year-old twin girls Sofie Leigh and Tessa Jayne. “I had a nice career. I won multiple graded stakes and multiple stakes and won around 600 races. My life changed a little bit when I had my children. I had them later [in life],” Tullock said. “When you’re training for multiple owners, it takes up a lot of time and requires a lot of traveling and just being an older father, I didn’t want to spend that much time away from my kids. I just wanted to spend more time with them so it led me to think about going in a different direction. Timothy J. Tullock Jr. was born and raised in Great Barrington, a town of around 7,000 people in western Massachusetts near the New York border that came alive every year with the Great Barrington Fair that dated back to 1859, before even fabled Saratoga Race Course opened its doors, and grew when pari-mutuel betting was added in 1940. He later moved a little more than an hour east to Northampton, also popular with fair and racing fans. “My dad had a horse and he bought me a pony when I was 18 months old. Growing up in Great Barrington, the biggest thing that happened every year was the fair. I liked horses and I loved going there and seeing the horses race. It was just a natural fit for me,” Tullock said. “I watched my first horse races at the Great Barrington Fair. That was a great place. Tullock later worked for late trainer Eddie Kelly and began training on his own in 1994, spending colder months in South Florida and returning to the Mid-Atlantic with the warmer weather. He met his wife in the summer of 1999 and settled in Maryland a year later. “I was basically a teenager when I worked at the fairs and then a little bit at Rockingham Park, but then I had a horse show background so out of school I worked at a show barn in Florida and then New Jersey and I would go to the fairs,” Tullock said. “My first boss out of school was gracious enough to give me time off during the fairs so I could go up to Marshfield and Northampton. By then, that was pretty much all that was left. Tullock’s best-known horse is Buster’s Daydream, a chestnut son of champion sprinter Housebuster that put together a four-race win streak in 2001 starting with his maiden victory at legendary Pimlico Race Course that April and continuing in the Flash (G3) and Tremont (G3) at Belmont Park and the Sanford (G2) at Saratoga. He ran fourth as the favorite that August in the Ellis Park Juvenile and was subsequently retired with an injury. Sensibly Chic “was the best horse I had,” Tullock said of the mare that won more than half of her $511,227 bankroll for Tullock in a 23-race career that included eight wins, four in stakes, topped by the 2005 Vagrancy Handicap (G2) at Belmont. Florida-bred Abbondanza also won four stakes and nearly $380,000 in purse earnings from 27 starts, taking the Hirsch Jacobs – now run as the Chick Lang – on the undercard of the 2004 Preakness (G1). Abbondanza also placed in two graded stakes that year and gave Tullock his lone Breeders’ Cup starter. The son of Alphabet Soup set the pace for a half-mile before fading to finish 11th in the 2004 Sprint at Lone Star Park behind eventual Eclipse Award champion Speightstown. Tullock’s other graded-stakes win came with Full Moon Blues in the 2010 Tempted (G3) at Aqueduct Racetrack, just a few weeks after his daughters were born. Gattopardo and Yankee Wildcat were also among his stakes winners. It’s clear listening to Tullock that he has a knowledge and passion for racing that shines through no matter if he’s training, watching or talking horses, and is eager to lend a hand whenever possible to promote the sport.